The Shanghai Composite had its largest weekly decline in 20-months on concerns that the government could get more aggressive in its efforts to contain rising home prices. Fearing a property bubble, the government has been trying to contain the market through tight policies. However, new data shows that on a month-over-month basis home prices were up in 53 of 70 cities in January. Just 10 cities saw price declines and seven saw prices stay flat. So does this mean the government will get even more aggressive? Back in November we reported that Beijing was considering expanding an experimental property tax program. More recently there were rumours that down-payment ratio for homes was expected to go up to 70 per cent. This was followed by an official statement earlier this week at a State Council meeting that was chaired by outgoing premier Wen Jiabao. 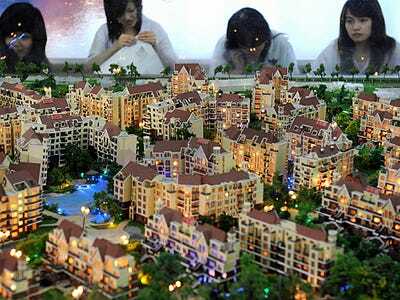 Officials called for improvement in and stricter implementation of housing market tightening measures. Cities that already have such measures in place were asked to maintain their “grip”, while local governments will be asked to put in place measures in cities where home prices have surged too fast. Local governments have also been asked to make controlling home prices an “annual objective” and “establish a system to assess officials’ performance in stabilizing prices,” according to Caixin Online. The State Council also promised to increase supply of land and housing, and speed up the planning and construction of affordable housing. Moreover, the People’s Bank of China let 910 billion yuan exit the interbank market this week and returned to using longer-term forward repos to drain cash from the market for the first time since June, according to CNBC. While some thought this monetary tightening had to do with reducing liquidity to keep speculation in check, others have argued that this was just the central bank’s way of offsetting its record injection ahead of the Chinese New Year holiday. The combination of monetary tightening and property curbs sent investors into a panic but Bank of America’s Ting Lu writes that the State Council’s announcement “pretty much reiterated existing measures instead of declaring new one”. This he says is because 1) the call to expand property tax trials has been mentioned before, including in the new income distribution plan; 2) almost all big cities already have “implicit” home price targets; and 3) increasing land supply and speeding up social housing have been mentioned since 2010. Lu also believes that because of the low transaction volume during the Chinese New Year holiday, policymakers are unlikely to act right away. And because of the over-supply in lower tier cities and under supply in bigger cities, new curbs will target a few specific cities. And it’s important to remember that China is pushing urbanization as a way to drive economic growth. “With the push of urbanization, new leaders could choose to focus on increasing home supply rather than curbing demand to seek the final solution to the property market,” according to Ting.